The SISSI infrared beamline at Elettra extracts the IR and visible components of synchrotron emission for performing spectroscopy, microspectroscopy and imaging. The applications cover a wide range of research fields, including surface and materials science, biochemistry, forensics, microanalysis, geology, cell biology, biomedical diagnostics, microfluidics, high-pressures, time resolved IR, conservation science, protein folding, chemical kinetics etc. The SISSI beamline is divided into two branch lines. For the solid state branchline, a Bruker VERTEX 70v spectrometer, which allows coverage of the entire spectrum from THz to visible frequencies, is available. The branch line is also equipped with cryostats and diamond anvil cell, thus permitting exploration of the behavior of matter under extreme conditions of temperature and pressure. 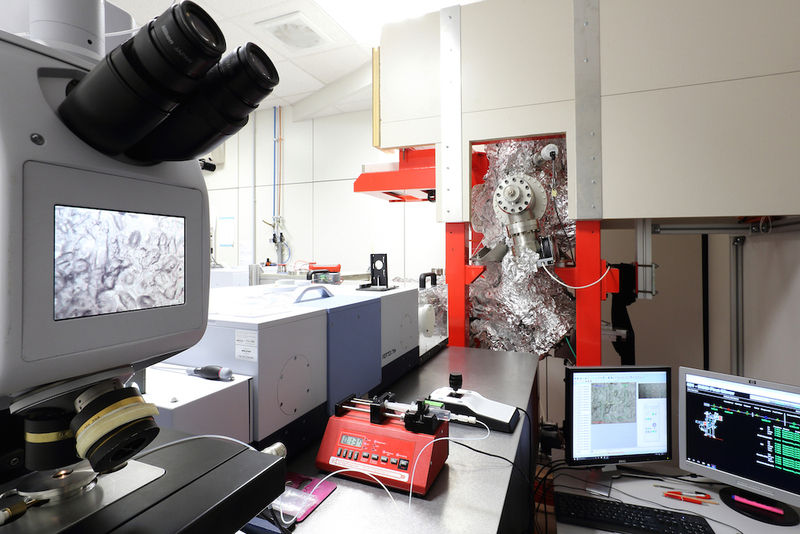 The life sciences branchline is equipped with a Bruker VERTEX 70 interferometer coupled with a Hyperion 3000 Vis/IR microscope. A new VERTEX 70v FM spectrometer is coming soon, capable of covering the FIR/THz and MIR in a single scan. The branch line is further optimized for FTIR microscopy and imaging in the MIR, being also equipped with a 64×64 pixel Focal Plane Array (FPA) detector for fast sample imaging. Several commercial sampling accessories are available, as well as in-house made fluidic devices for analysis of hydrated samples.